For the record: Davis McAlary is a character, a fiction, a role played superbly by Steve Zahn. Davis Rogan is a real guy. A musician who lives in New Orleans, he has an encyclopedic knowledge of music, is physically huge and very, very funny. He is by another standard, a character. Last Sunday night after the latest episode of Treme aired to a packed sitting-on-the-floor-silently-during-the-show crowd (seriously, if you'd had to go to the bathroom you'd have been out of luck during the show as the HiHo was wall to wall), Davis Rogan and his band took to the stage. Eventually. Although often the HiHo will empty out almost completely after the Treme viewing, lots of folks stayed to hear Davis. Some appeared to be his friends, others, as he quipped between songs, stayed out of curiousity. As he and his band, comprised of Jimbo Walsh, Charlie Kohlmeyer and accompanied by Efrem Towns on trumpet, started playing I watched the crowd not sure if they would stay but they did. It wasn't wall to wall anymore, but the people who were there were clearly loving it, and loving him. They played a set, Davis was tossing his new CD to people in the audience, and one woman walked up on the stage to get one from his very hands. Now, here's where I might be spilling the beans. This guy is a sweetheart, a truly sensitive sweetheart, although I think he covers it well with bluster and manic self-deprecating humor so no one knows. His kindness to the woman who walked up on stage was just the first glimpse of that side of him. He seemed genuinely stunned that it mattered to her that she get straight from him. "Really?" he said as he handed it to her. After that set, a few left and the rest of us retired to the bar. Davis sat down next to me and I learned a lot. He and Efrem hung out drinking with us and between them I had to listen fast, I know that's a strange term for listening, but the speed with which these two blasted musical information and brass band lore was astonishing. When Efrem ordered a Hennessy, Davis said, "Don't know how that guy drinks that stuff! It's only good for cooking." I asked him if he cooked, and very seriously he said, "Oh yeah. I cook. Kermit barbecues, but I COOK." Efrem backed him up and we tried to talk him into cooking for us. We talked about his school, his college ("By the way," says he, "do you know who else went to Reed College on the Treme staff? Eric Overmyer.") and I tried to imagine him in Portland as a very young man. He's just so totally OF New Orleans. I asked him what his long term goal was, and although we were already perilously close to being seriously drunk, he very seriously answered, "To make a living playing and writing music." That answer, by the way, was interrupted by the replaying of the Treme episode and the scene where Antoine (Wendell Pierce) walks up to the closed Gigi's. There is music in the background of that scene. Davis interrupted his answer to point at the screen and say, "That's me making money. That's MY music you're hearing." To talk with Davis Rogan is to get on a roller coaster and you better not be afraid of the apex. Just close your eyes and hang on. Try to follow along, you'll be the better for it. He can switch subjects, answer someone's question, then come back to the original subject all in the blink of an eye. We started talking about his new CD. I told him the the Louisiana Music Factory had had it prominently displayed the day the Treme cast was there. He looked steadily at me and asked if I'd bought it. No, I hadn't. There was no way to get to it as the store was so crowded, which was true. There was very little possibility of shopping at the Factory that day. His eyes narrowed and he asked if I'd bought his first CD. No. I hadn't. Truth be told I didn't know there was one. Hell, it could have been a construct of the Treme writers. See, that's the part he's having trouble with, some of those constructs. I could see it on his face. I asked if he had a girlfriend. No. He doesn't. Does he really write lyrics on the wall? Yes, he did once but mostly that's a Simon creation. He laughed when I said I had a crush on the Messrs. Pierce and Peters, saying, "Not Michael Huisman?" I told him if I was 25 he'd probably be in the running. Yes, it really is Huisman, Zahn and young India Ennenga we hear playing on the show. I thought it was Davis, but he said no, it's really the actors and that he taught them all. He was proud of that. "Huisman is the best player of the three and a really, really nice guy." After a couple more drinks (and I dare you to keep up with him--game girl that I am I gave it my best shot) he decided to play another set. There were only a few of us there, but he and the guys played their heart out and we all enjoyed it. I think those of us there felt like they were playing only for us. At one point he talked about tipping the band, so I grabbed the tip bucket and harassed the patrons out of another forty bucks or so. As I put the tip jar down, someone tossed a hundred dollar bill over my shoulder into the bucket. I never saw who did it. While he's asking for tips, he's still giving away CD's. Giving them away. Later he asked me to split the hundred (which he now had changed) into three piles. I failed miserably and it was left to Miss Clawdy to fix the error. When that set was done, the HiHo crew and the band sat down and, yup, drank some more. Efrem had another only-good-for-cooking cognac and the two of them talked to me about the Dirty Dozen, Uncle Lionel's son (known around town apparently as Stinky), Milton Batiste. Finally they decide to pack it in. Davis had all the CD's in a Treme tote bag, which I frankly coveted. While we were sitting at the bar, he asked Efrem to go get two CD's which he tried to give me. I told him that I'd happily take one, but I wanted to buy it and handed him ten dollars. When I explained that I'm a broke writer and he's a broke musician and we had to help each other out as artists he seemed truly surprised. Then, eyes narrowed again, he said, "You really want that bag though, don't you." I had, in fact, been trying to get that bag, offering to buy it at one point. He got up from the bar and started breaking things down on stage. Suddenly I hear him say, "If you want the bag, help me find my keyboard case." I couldn't find it. Someone on stage asked for a light. That I could provide. Then I saw Efrem standing next to me with a tiny, jewel-like trumpet. I asked him what on earth that was. "My pocket trumpet," came the reply. He then played a song right in my ear, asked me what I wanted to hear, and I said I'll Fly Away. With the bell of the pocket trumpet five inches from my left ear, he launched into it. I thought that if I became deaf from that tiny trumpet bell but the deafness came after he finished playing that song, it would be okay with me. It was beautiful. Then Davis says, "Here's the bag. Help me load out." I grabbed his piano stool and took it out to his car which looked remarkably like McAlary's only with all its windows intact. "Come on. Get in the car. We're going to Mimi's." I had my bicycle there so I told him I'd meet him, and did. Somewhere through the liquor haze I got home about 4AM. The next day I listened to his CD. Admittedly I wasn't sure what to expect. I listened, then listened again, then listened again. Once again I was struck by the bluster covering up the sensitivity. The lyrics for The New Ninth Ward are a sardonic look at the sociological changes in New Orleans since the storm. The guy can certainly write, and he's a tremendous observer. His rant on Back in the United States asking for a go-cup in Europe--"Get me a plastic cup and put some ice in it, some ice in it!" --struck a chord with me because when I to into the United States I'm still disconcerted by the no go-cup rule. He does two versions of Rivers of Babylon, with John Boutte and others singing harmony, that are gorgeous. (I particularly liked the Mississippi Dub Mix he tacked on to the end of the CD. He likes experimenting and that experiment was very successful.) In Bones in the Bouillabaise, one of my favorites, it was clear that the man does indeed cook. His humor shines throughout, and while you can absolutely see how Steve Zahn got some of Rogan's speaking cadences down pat, it's somehow different listening to the real Davis on a tangent. And for anyone, anyone, who wants to interview the Real Davis, I'd suggest you come armed with some questions he's not been asked before or your interview will be merely a re-write of two of his songs. In funny, poignant and sometimes faux arrogant lyrics he answers just about every question that he's no doubt been asked a zillion times. In Fame he calls Jimbo on the phone, saying the "mega-check has arrived" and asking him to have brunch with him consisting of whiskey and sushi. Jimbo's recorded response is, "You've got some maturity issues." Davis says in the song that now "all the girls are returning my phone calls and no one has the guts to tell me I'm lame." (Great guitar solo by Mark Paradis.) In My Every Day he says that yes his house is a little bit messy, asks people to stop asking him, explains that he never sacrificed a chicken on the radio and regarding the Garden District upbringing of McAlary, says he's a Carrollton boy but "it allows the producers a window into a certain facet of New Orleans society" to make McAlary come from money. While clearly ambivalent about his being confused with the McAlary character, he's sometimes amused, sometimes angry, sometimes seemingly amazed by his good fortune, and he puts it all out there. These are intelligent, brave, naked lyrics. The guy has balls, that's for sure. I didn't go there to interview him. I didn't go there intending to write anything about him. I just went to watch the Treme episode with friends. He didn't ask me to write this and might even be upset that I did, but he was just too interesting not to. Now, I guess I better find a way to drop that bottle of Makers off to him. I promised I would at the point that he was told "well drinks only for the band." I should be singing Damn You, Sweet Bourbon as I hand it off to him. I think he thinks no one is listening, but I was. And yeah, shhhhh, the guy really is a sweetheart. After a weirdly cold Tuesday, Wednesday warmed up a little weatherwise. Wednesday also warmed up my soul in so many ways. Although I missed my two current crushes, Messrs. Wendell Pierce and Clarke Peters, at the HBO Treme signing at Louisiana Music Factory, I was still lucky to have my shoes on Decatur Street yesterday. I locked up my bike a couple minutes after noon and had just missed the Treme gang, but Kermit Ruffins was just getting started. I had been waiting months to order a DVD about Big Chief Donald Harrison, Sr. called Guardians of the Flame. I'd found it on Music Factory's website but thought I'd just grab it on my way in the door. No. I was told. No. It might be on the website but they don't have it and don't know where to get it. Momentarily deflated, I waded in through the huge door to door and out both doors crowd. I noted the Treme printed white hanky some were carrying and chided myself for having been late. But ah well, Kermit was playing. The place was full of locals and visitors to Jazz Fest alike. (More on the Jazz Festers later.) They loved him. I heard so many of them saying, "And this is FREE!" Yeah, and while yesterday's lineup at the Factory was unusually packed, the level and quantity of music in New Orleans is always high. It was fun to see the look of incredulity on the visitors' faces as they enjoyed themselves, were astounded to see people in the crowd in a store with beers in their hand at noon, and browsed the rich CD bins they were in front of, grabbing something they hadn't known they'd wanted when they first came in. Imagine if they'd had access to the other bins, but that was not to be. Where they were is pretty much where they had to stay unless they wanted to fight their way through the crowd. Kermit ended his set and headed to the cash register to sign CD's. I happened to be standing next to him as an elderly couple from Vancouver who had just purchased the CD waited patiently for him to notice them. By now, Irvin Mayfield is starting to play. They waited and looked confused as Kermit was listening to Mayfield get started and cracked a beer. I asked them if they were waiting for him to sign it for them. They said they were, looking bewildered. I leaned over the counter between us and said, "Kermit, would you mind signing this CD for these nice people?" "Of course!" he said warmly, grabbing the CD, talking to the gentleman about an inscription. The Vancouver lady said thank you and seemed surprised that there weren't security and body guards or a sign up sheet or something. They were beyond thrilled, him holding the CD up to show her. On the way out the door, this 70-ish couple looked like they were 15 coming out of their first record store together. Meanwhile, Mayfield is playing and bantering with Kermit about how Kermit won't go to his (Mayfield's) club because he doesn't have Bud Light. Kermit is laughing and hollering, "That's exactly why!" Mayfield's singer, whose first name Michael is all I caught, was as smooth and perfect as a sip of brandy. (If anyone can enlighten me as to his full name, I'll be grateful.) The crowd shifted a little, but as a few went out, even more came in. Mayfield told the crowd he hoped his funeral would be as big as Kermit's. They bantered about that a bit more, Kermit laughing all the while, then Mayfield started in to I'll Fly Away. It was clear most of the crowd didn't know the words, but eventually most of them got it. I was singing croakily and badly while hearing Kermit, behind the counter, singing over my left shoulder. It was one of those moments we live for here. It was as though all I could hear was his voice out of the entire crowd's and I hoped that that would be what would be playing on my internal juke box as I faded out of this world. Mayfield then started through a list of important NOLA musicians who had flown away and the crowd, finally completely clear on the chorus, raised a hand or a cheer for each name while continuing to sing. While Kermit was on my left singing, on the right hand wall photos of Professor Longhair and Milton Batiste were looking down. I'm telling ya, it's those little stellar hair-on-the-back-of-the-arm raising seconds that put you in your place on the continuum and everything else falls away. That would have been enough. Right there. But the Basin Street Records tribute continued. Everyone's set had been a little long, so Glen Andrews said they'd hurry up and get ready. Earlier he'd been trying to get through the crowd. He said he had to GO! I laughingly said I did too but that I didn't see a chance of getting to those bathrooms that seemed miles away. He said, "Just get behind me. We'll get there." With his horn on his rather imposing back, he just powered through. I was so grateful. Now he and the Rebirth guys were getting ready to blow the CD's into other bins. And they surely did. Everyone in their little two foot square of the planet was dancing. After Rebirth Brass Band ended, we headed across the street to get a beer. It was by now, about 3PM. We climbed across the trailer hitches on Gregg Allman's tour bus (he was playing HOB last night) and found a table and two stools. Oh yeah. Life is good. Unfortunately this place is blasting 60's rock classics. Good ones mind you, and on probably any other day I mightn't have been discombobulated at hearing Led Zeppelin over my beer, in fact I might have liked it. It was such a strange change from the hyper-local scene we'd just left. 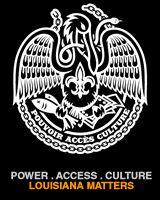 Nevertheless, we had a couple beers, gave a couple people directions and had a woman point at the fleur de lis on my shirt and ask me what that symbol was called. We stayed there, missing Garage a Trois but wanted to go back for Dumpstaphunk. Silly me, I thought maybe it would be less crowded. Nope. But it didn't matter. Right before we waded back into the Music Factory, the Urban Legend across from me (explanation of that comes later) says, "Hey, that's Mos Def." I turned and it was. I walked to the corner, acted like a completely star-struck kid and said, "Thank you so much for the BP version of Ain't My Fault. We play it almost every morning at our house. I'm wondering if you could sign my bag." He did. Not knowing what to call him, Mr. Def just didn't sound right, I then said, "By the way, the writing of Mathematics is absolutely remarkable." He looked at me like I had three heads. I am sure he in no way expected a woman of my age to even have heard Mathematics. But now my yellow bag flaunts Lloyd Price, Mos Def and Kermit Ruffins next to the Storyville girl. Dumpstaphunk rocked it. Totally rocked it. Next to us was a couple from Massachusetts. Here for Jazz Fest, their first time. They were charming, he was red/blurry eyed and she was bursting with energy. She kept saying El-eye-sian Fields. After the third time, between songs, I leaned over and gave her the proper pronunciation. She then asked if Dumpstaphunk had some Neville's in it, and they really were total music freaks with a wide range of musical knowledge and interest. I told her yes, there were, but that they all hid their ages so well I could never keep track of who was who's son or grandson. We talked a bit more while the band got ready to play the next song, and another out of town couple, hearing our conversation, inched closer and joined in. They were all so sweet, so interested. I pointed them to Dumpstaphunk's CD as I had seen it on my way through the crowd. Just then I looked up and Donald Harrison, Jr. is walking right into me. I said, "Excuse me, Mr. Harrison!" He kindly stopped and I told him I couldn't find the Guardians of the Flame DVD and did he know where I could get one. He laughed and said, "No. I don't even own a copy!" I thanked him and he went on his way. The out of town guests were stupefied. People were dancing all the way up the staircase and out into the streets. I have no idea how many toes were stomped or how many bruises folks got from flying, dancing elbows, but no one cared. We went back across the street to our table and stools for another beer and our backs. This was when we met the one out of seven Jazz Festers who needed a smack upside his head. He asked what was going on across the street. I told him and pointed to the schedule on the bar's door telling him that there would be great stuff going on there all week. He puffed out his chest and said, "I'm not local, but I'm here for two weeks every year so I know some stuff." Okay. 'Nuff said. We figured one out of seven wasn't a bad ratio of douchebags to nice people. At that point we decided since it was almost 5PM that we'd wander down to see if Dwayne Dopsie was playing, but forgot that it was Wednesday and he didn't play til Thursday so off we went to the Blacksmith Shop where I discovered that I have been living with an Urban Legend. Somehow the conversation with the waiter came around to "I heard about a really bad accident with one of you buggy driver guys. Before I started working here, but heard it was really bad." We started laughing, then of course, the story was recounted broken bone by broken bone with the waiter amazed that he was looking at the actual guy. It was kind of fun in that continuum sort of way that the story was now part of the "who knows what's really true" history of that place. I guess I'll have to have an Urban Legend tshirt made up now. After more beer than we'd anticipated drinking, we decided we were hungry and headed for Frenchmen Street. We got to Adolfo's at the perfect time, only 20 minutes to wait and ate an over the top meal, as is always the case with that place. After a short conference we decide to leave the bikes locked up and see what's going on over there. After all, by now it's well into evening, so we do the circuit to see who's playing where and when. Great names, all, but we decide to continue down to the Maison. At the corner of Chartres and Frenchmen was some kind of experimental band, but no Young Fellaz, and across the street was a pickup truck with an impromptu art show in the bed of the truck. Two artists, locals, had set up shop and the work was amazing. Kelly Curry, an artist and mural specialist, had a painting of Frenchmen on Halloween that she said she'd painted in real time. She had perched on a balcony and painted the scene as it was happening. I wanted it but couldn't afford it. Her other work was equally stunning. Showing with her was a young man named Joe Parker. There was one piece that stopped me in my tracks, although with a truck full of gorgeous art these two would have stopped me anyway. A combination of sculpture and painting, I had to have it and could actually afford it, so he wrapped it up and tomorrow I hang it. I have both of their emails and other contacts if you're interested, and you should be. I was stupid and didn't take a photo of this remarkable collection of pieces. On our way down the street we encounter the Sweet Street Symphony. A street group made up of lots of young local musicians that we'd seen in various configurations all over New Orleans. Fun and wonderful, and thoroughly enjoying themselves, we stayed through a set. Once again the looks on the out of towners' faces were priceless. They all look astonished to find fine musicians standing in the streets playing for tips. I couldn't help but wonder if the town they lived in would welcome these musicians to their streets. Lugging our new purchase we get just outside the door of the Maison, are contemplating heading home, when we hear two guitars sounding so incredible that we were sure they'd be on fire when we went in the place. They were playing, of all things, a cover of Cream's I'm Glad. When we got in there we found a superlative band headed up by a man named Roosevelt Collier. Unwieldy package or not, we were staying. The band was comprised of super-talents and watching Collier's hands was a treat. Turns out this guy was a finalist in the Guitar Center King of the Blues competition in '09. A friend had just this week sent me a reminder of who had won two years before. Clearly, there's some stiff competition there if Collier was a finalist and didn't win. Ya know what, better yet, watch this, found when we got home. Twelve hours of incredible music, not one cover charge and all done on bicycles in a relatively small area. Twelve hours, no gates. Twelve hours and the stages were all over town. We were so lucky. From being peered down upon by the ghost of Fess to a poster for Jello Biafra on a pole advertising his current incarnation, the music was varied and wonderful and so, so plentiful. As I sank into bed I felt bad for that guy who only gets to be here two weeks a year and thinks he "knows stuff." He really has no idea. 1. When was it decreed from on high that Americans should always, always have cheaper gasoline than the rest of the world? Where did we get this idea? Europeans have been paying higher prices for years, while we kept buying SUV's and the ever bigger, greater torque, crew cab pickups. In February 2011, when the average cost per gallon here in the US was $4.03/gal, it was $8+/gal in Belgium, France, Italy and the UK; it was $9+/gal in the Netherlands and Germany. While Donald Trump hollers about "Americans not liking paying $5/gal," and yeah, he's right, we don't, it makes me wonder at what point we, who use such a high percentage of the world's resources, decided it was our birthright to have lower gas prices than everyone else. 2. While everyone is upset by GE's ability to make huge profits and pay no taxes, it's just one of many corporations which have really remarkably talented accountants. Meanwhile, every single politician out there starts out with the statement "and we have to create more jobs. "<---This seeming to be a self-evident point, I'm curious why the conservatives railing about "people shipping our jobs overseas" don't look at the cause of that and indeed, continue to feel that corporations should somehow be allowed tax breaks on various projects or tax cuts and/or limits on their profits. I know this will be viewed by many as crazy, but I think we should be doing a head count of those jobs overseas and levee a fine on any corporation who chooses to remove a job to an overseas destination. A hefty fine, say, the difference between the salary they pay to the Indonesian sweat shop worker and what they'd have to pay to an American laborer. If we did that, with an accurate head count of jobs exported, it might make the American manufacturer rethink job removal. Fine them. Per head. For God's sake don't give them tax credits or tax cuts. "Labor costs in America are prohibitive so we take it overseas." Okay then. Don't pay the wages of that American worker whom you expect to buy your product, but do pay a fine for closing the plant that that same American worker was just fired from. Simple formula, way easy for the whizz bang accountants they have: Close the plant, 2500 people out of work (nevermind what happens to the economy of the area they live in, we won't fine them for that). Look at your books from last year, take the figure in Box A (2500 x wages for a year), then compute the wages paid to the 2500 people you hire in (name the country) this year in Box B. Subtract Box B from Box A. That's your fine. Help lower the deficit and maybe rethink your overseas labor plan. Ya know, those fine consumers you try to separate from their money have to have a living wage in order to consume your product. Living wage? Yeah, living wage. 3. Bubble. Burst. Bailout. Bonus. Bogus investment schemes to sell "derivatives." Bet against the derivatives being a good investment. Let's move from B to R. Regulation of this Wall Street nonsense is still non-existent. It could happen again. Ask the folks who put in the regulations in 1930 which were dismantled piecemeal. And we weren't paying attention. Which gives us an F as in Foreclosure. Although I suppose I could forge that report card and turn the F into an A if I sell Adjustable Rate Mortgages to. . . .nevermind, not a good idea, eventually I'll be found out. Nevermind, I have my stock options and my multi-million dollar severance so it's all good. Aren't I lucky that I work in the only industry I can think of that rewards reckless, unethical, and in some cases, criminal behavior. Then I can get hired as a consultant or lobbyist, when I should be put on the town square, have a guy with a sword whack the buttons off my double breasted just before the leg irons go on. Rotten veggies will be provided to the onlooking crowd gratis. 4. Donald Trump. Seriously? If you are serious, or view him as a serious candidate, which apparently some do, can someone please tell me why? 5. Chris Rock has the right idea. Make guns cheap and bullets cost $5000 dollars each. Folks will think twice before popping off a $5K piece of property. 6. So now Bin Laden's dead. Shades of Dillinger, the Dalton gang. Pics of his body will be at a premium. Is that enough? Can we bring our people home now? Or are we such warmongers that we'll let them keep getting brain injuries that the VA doesn't want to pay the medical care for? Postcards of Bin Laden's body on sale at the gift shop. $5.50 a pop. Frame them. Nevertheless, bravo to our folks who did him in (says the person for whom Ghandi is the model to aspire to). Perhaps now we can get some sanity back into our government without the hysteria. My question still remains: Why'd it take so long? And why do most folks think the war on Iraq, which is bankrupting our government, is a reasonable thing to continue?